The transportation industry is facing an evolving set of challenges. Historic freight demand is further stretching truck capacity, which already had been constrained by the industry’s chronic shortage of professional drivers. At the same time, motor carriers must carefully comply with driver hours-of-service limits while still meeting shippers’ increasing expectations regarding service and freight visibility. In the absence of a quick fix to increase the number of trucks on the road to keep up with this rising freight demand, the remaining option is to find a way to wring out more utilization of the trucks already on the road. Enter load-tracking technology, which could help raise efficiency in the transportation market by improving logistics planning and calculating trip times more precisely, industry experts said. Onboard technology has been used for years or even decades by larger carriers to automatically track the location of trucks and trailers, but what’s relatively new is the spread of comprehensive, data-gathering technology that automatically feeds load- status information back to the freight broker and the shipper. Customers may not necessarily be interested in where the load is at a given moment, but every customer wants to know when the load will arrive and what condition it will arrive in. Jay Delaney, senior director of product management at TMW Systems, a transportation software firm that is part of Trimble, said the data point most sought after by customers often is an accurate estimated time of arrival. A true ETA, calculated with modern technology, can factor in weather, traffic patterns, rest stops and situational delays to give the most accurate estimate of the time the load will take to arrive, said Delaney, adding that TMW is developing software specifically to calculate these more precise ETAs. When carriers and their customers know exactly when a load will arrive, they are in a better position to minimize waiting and unloading time, thus allowing the driver to get back on the road as soon as possible. Time lost due to events that could have been planned for or proactively dealt with is money wasted. Meanwhile, carriers and freight brokers are taking steps to capture real-time location information for shipments in transit. 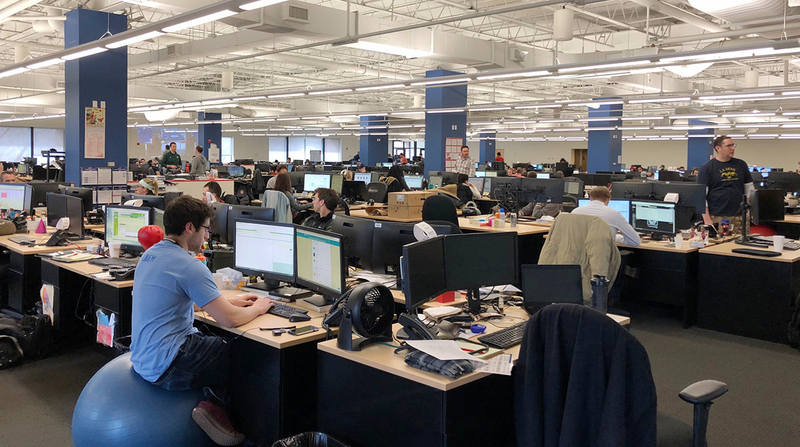 Dupré Logistics, for example, recently announced it is implementing Descartes Systems’ Macro- Point freight visibility product to help grow its brokerage division. Logistics firms are “taking advantage of advanced freight visibility to better serve their customers while operating more effectively,” said Dan Cicerchi, vice president at Descartes MacroPoint Solutions. Robert Brothers, product development manager at McLeod Software, said increased availability of driver information previously only given to carriers now allows brokers to offer their customers similar levels of service and adjust their prices accordingly. In a market where too much freight is being moved by too few trucks, access to information allows those moving freight to maximize capacity and offer more options for moving the freight without affecting price. With access to information automatically collected by the ELD, the broker can more proactively respond to unexpected events or simply help meet the driver’s needs along the route, she said. Given the set hours of service a driver is permitted to work, emphasis must be placed on accounting for all of those hours on each trip, factoring in parking, rest and food in order to maximize efficiency. If a delay occurs, having auto- matic, ready access to the driver’s location, situation and options for completing the trip puts the broker and the carrier in a better position to salvage the situation, Snider said. While opinions may differ regarding the overall net effect of the ELD mandate, transportation firms are finding ways to utilize this new source of operational data. The integration of systems and information among the carrier, the broker and the customer can make for a more efficient, more proactive and more effective supply chain, brokers and technology vendors said. The true value of increasing visibility, they said, is enhancing the partnership among the parties involved in the load, leading to increasingly seamless transport.